A dependency is a relationship between Jira issues, where one issue blocks or is blocked by another issue. Dependencies can be added to individual issues in the scope table of your Portfolio plan. The relationship between issues with a dependency between them is always finish > start. The downstream issue will never be scheduled to start until the issue it needs is fully complete. Ensure that you have set the issue links between dependent issues in your Jira application. You can check your configuration by going to Jira > Settings > Issues > Issue linking. Learn more about Jira issue linking. To configure Portfolio dependencies, go to Portfolio > Settings > Portfolio Dependencies. In Portfolio for Jira, the blocks and blocked by dependencies are set by default. Add the issue link types. If necessary, click Swap to set the correct dependency order. 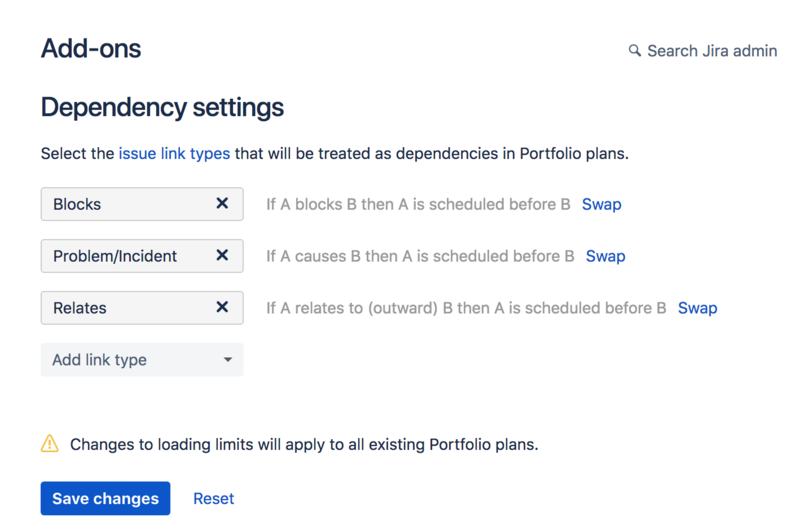 Portfolio for Jira's schedule will now consider the issue links as scheduling dependencies. Currently, Portfolio for Jira doesn't support dependencies between subtasks. These dependencies are interpreted as circular dependencies which will result in an error. To resolve this error, remove all dependencies between subtasks of the same parent.